Static Cling Labels – Keeps Your Customer Coming Back! Static Clings are made of a flexible vinyl that has a very smooth coat and will stick to clean glass surfaces utilizing the moisture in the air and on the glass to adhere to the surface. If you need to keep track of each individual label, adding a series of consecutive numbers is no problem. Perfect for parking permits, property access or serializing products. 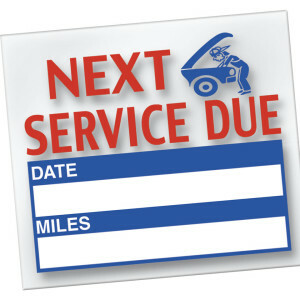 Our very popular automotive static cling labels for oil changes. We can print an area with a block of white ink to allowing you to hand write information. Blue Line Labels produces custom window labels and static cling labels with the finest commercial label printing equipment available. Utilizing new technology with our digital and flexographic label printing machines, we will meet and exceed your needs. Static cling vehicle stickers are useful for controlling parking lots, pick-up and drop-off areas in schools, apartments and parking areas. Add barcodes for gated communities that need to scan for automatic gate access. Sticks with static cling and no need for any adhesive. With over 20 years of label experience, we can help from design to delivery. 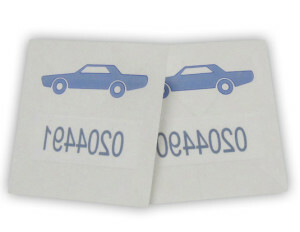 Custom static cling stickers can also be produced using a “low tack” adhesive film. This material can be more cost effective than the static cling vinyl material and still be easily removed from glass without any adhesive residue. When you live in very cold weather conditions we recommend a low tack adhesive. This special adhesive applied to your labels can easily be removed and re-applied again and again. In cold weather and dry climates static clings tend to dry up, freeze and then fall off easily. The vinyl material will not retain its “cling” abilities for more than a year or two depending on the conditions the cling is exposed to. 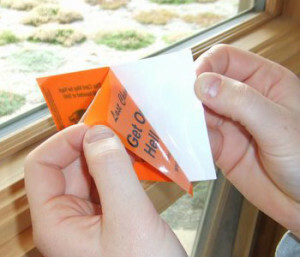 Clear Face Adhesive: If your label will to be stuck to the inside of a window so it can only be seen from the outside. The printed colored ink areas of the label will printed with a opaque white ink. Clear Back Adhesive: This is the most common way labels are produced. The sticky is on the back. Clear stickers always have a layer of opaque white ink that is put behind the printed ink areas of the label, leaving the non-image areas of the sticker clear. 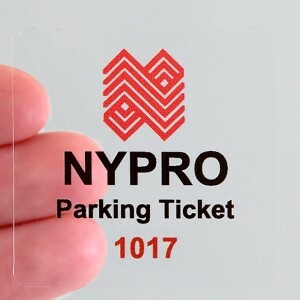 Custom parking stickers cling perfect to the inside of your car glass & windshields. 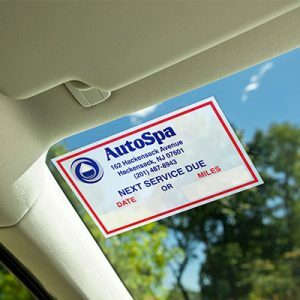 Static cling window labels are used for parking permits, automobile service reminders, beverage cold cases, promotional products, and for virtually any type of window advertising. Utilizing non-adhesive static cling label material and fade resistant inks, our custom window decals are easily removed from any glass surface without leaving behind sticky adhesive residue. Call Blue Line Labels about your custom static cling label needs at 1-800-609-7079.